The same dinosaur you know and love—now bigger and more scientifically accurate than ever. Though SUE the T. rex’s fossils are a snapshot of life 67 million years ago, the science around extinct animals is rarely set in stone. Get an in-depth look at SUE's scientific updates and new home in the Griffin Halls of Evolving Planet. SUE arrived here at the Field in 1997 and was unveiled in 2000, wowing the world as the largest, most complete Tyrannosaurus rex specimen discovered. But this didn’t mean scientists’ work was done; in a lot of ways, it was just getting started. SUE presented a unique opportunity to study many different bones that all belong to the same animal—a thrill for paleontologists. The new SUE, with added rib-like bones called gastralia and shifted posture. This is how SUE looked on display from 2000 to early 2018, before we made scientific updates. Compare how SUE's shape and pose changed from 2000 (left) to 2018 (right). My, what big gastralia you have! Perhaps the first thing you’ll notice when you visit SUE in the new gallery is that our fierce fossil looks more filled-out around the belly area. And it’s true—the skeleton is actually bigger than before. When fossil hunters first uncovered SUE, they found a set of rib-like bones that clearly belonged to the dinosaur, but no one was really sure where they fit in with the rest of the skeleton. Before we knew how SUE's gastralia fit in with the rest of the skeleton, these bones were on display in a separate case. Now we know that the gastralia sit below the ribs and along the belly. Most likely, they helped T. rex breathe by pushing air in and out of the lungs (we humans have a diaphragm for this purpose). SUE’s gastral basket is the most complete among over 30 known T. rex specimens. It includes 26 of approximately 60 total gastral bones. We don't know exactly how many bones make up the gastralia since most—but not all—segments consist of two pieces. And there isn't yet a complete T. rex gastralia for us to check out and confirm how many segments do have two pieces. People like to make T. rex skinny like a greyhound, but they were actually very barrel-chested. Adding the gastralia, with the first pair stretching 44 inches apart at the tips, meant adjusting other elements of the skeleton, including making the ribs wider. We also corrected SUE’s furcula—or wishbone, much like in your Thanksgiving turkey—and adjusted the shoulder blades. This lowered SUE’s arms and brought them forward a bit. Now, they look as though they could actually touch each other. The gastralia also enhance information about T. rex’s body mass. Previously, scientists measured leg bone circumference to determine body mass, which led to estimates of five to seven tons. But after 3D scanning every one of SUE’s bones and creating a digital model of the whole skeleton, scientists could do a 3D estimation of mass—this time determining that T. rex was even bigger than we thought, likely weighing nine or ten tons. SUE’s gallery in the Griffin Halls of Evolving Planet also gives you a sense of how T. rex moved and looked in life during the Late Cretaceous. Realistic animations of SUE walking, hunting, and drinking from a nearby river will give you a totally new perspective on T. rex—still fierce, but not exactly the roaring, crashing creature from Jurassic Park. So, how did T. rex move, and how do we know? It’s a combination of what SUE’s bones tell us and what we can observe in living animals. For all bipedal animals, T. rex and humans included, walking and running requires putting all your body mass on one leg for a very brief moment. This means that T. rex’s speed is limited by its body mass and how much leg muscle is required to keep the knee erect under the force of the animal’s mass at full speed. Using the 3D digital model of SUE and new size estimates, paired with other T. rex research, we estimate SUE’s top speed to be a fast walk of 15 miles per hour. From there, our scientists worked with an animation team in the UK to give life to SUE’s mechanics, referencing crocodilians and large modern-day birds (a.k.a. living dinosaurs). 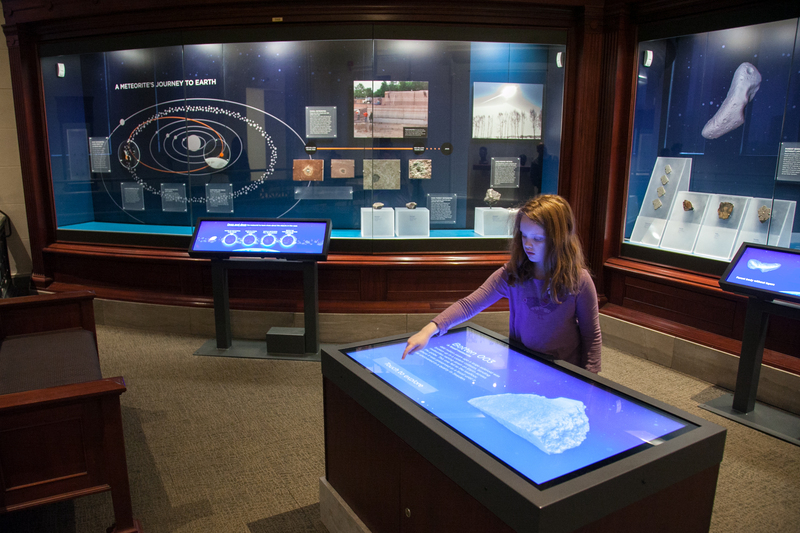 In the exhibition, see how SUE comes to life through animations that show how T. rex moved and interacted with a Cretaceous landscape and other creatures that inhabited it. Getting as close as possible to a living, breathing T. rex means making some educated guesses based on research. For skin, our scientists followed the evidence of scales that are visible in a number of tyrannosaur fossils. While it’s possible that baby T. rex might’ve been feathery, we don’t have enough examples to support that yet. We also looked to living animals for guidance on certain aspects of appearance that aren’t preserved in fossils. For SUE’s eyes, we drew inspiration from crocodilians that have yellow-green eyes and a slit pupil. You’ll see that SUE’s body color is muted with stripes, which is true for many large predators. Think tigers: their stripes break up their shape and help them move undetected through tall grass. See our snarky, ham-loving theropod in a whole new light thanks to 20 years of collective T. rex research. 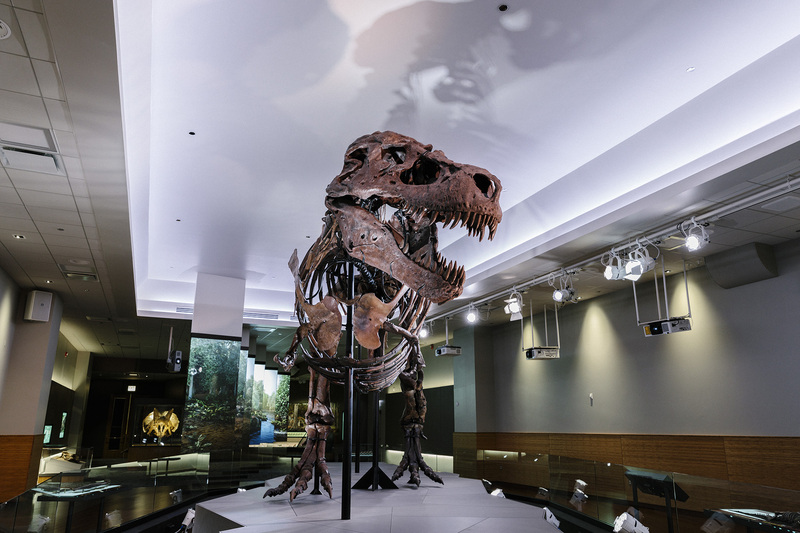 Updates to SUE the T. rex are part of the Griffin Dinosaur Experience, made possible by the generous support of the Kenneth C. Griffin Charitable Fund.